In part one of our eczema series, we discussed some of the possible causes of eczema, as well as ways to help heal or soothe outbreaks. Today, I wanted to share an interview with one of Organic Bath Co.’s customers who has dealt with the damaging effects of eczema herself. Meet Melissa! Melissa’s history with eczema started after the birth of her second child. She was given the diagnosis of Dyshidrotic Eczema and said that it came about from washing her hands constantly (as I’m sure all stay-at-home moms can relate to!) and drying them out. This was a new condition for Melissa and at first her doctor prescribed a steroid cream to control the outbreaks. Melissa was told by this doctor to be careful not to get the cream on her children – not an easy thing to do as a mother who is around her two small kids day in and day out! Because of this, Melissa could really only use the cream before bedtime. Physicians prescribe steroid creams for eczema outbreaks because, when absorbed by the skin, these steroids prevent the inflammatory response that skin cells can have against the irritant causing the eczema rash. While effective in many cases, the side effects of steroids might not always be worth the benefits. Topical steroids thin out the skin and can cause hypo-pigmentation or stretch marks. Now stretch marks from having your children (I mean tiger stripes!) are one thing, but having to deal with new marks when they’re easily preventable by swapping the steroid treatment for a less damaging alternative is quite another scenario! It’s also no wonder Melissa was told not to get this cream on her children – their skin is thinner than adults’ skin and therefore is more susceptible to damage from the steroids. With a weakened skin “barrier,” children can become even more sensitive to infection and outside pollutants entering the blood stream. Melissa raises a good point about paying attention to what products we use around family members or small children. If you wouldn’t feel comfortable putting it on them, why are you using it on your own skin? Conversely, if you find a product that is safe, gentle and effective for you… share the wealth with loved ones! “I love that my two year old daughter can use it too. It is safe and gentle enough for her skin, and she loves ‘being like mommy’.” How adorable is that?! Now, of course, as a mom of two, Melissa is often pressed for time or juggling multiple tasks at once. To keep her eczema at bay, she leaves the body butter open on her counter so she can grab some when she walks by. See? 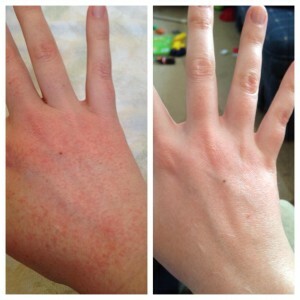 Healing your eczema doesn’t have to be dramatic and hazardous. With any organic product that has wholesome, soothing, restorative ingredients, you know what you’re getting and therefore can feel more in charge of your health and wellness. How have you taken charge of your eczema treatment? Did you insist on allergy testing or decline steroid creams when your physician offered to prescribe them? Ever dabble in the art of organic healing? Tell me your stories below or say hi on Twitter/Instagram @OrganicAbby !